Jerry Dipoto’s revamping of the Mariners’ roster is not finished. The new Mariners general manager made his third move in the span of 24 hours. Seattle agreed to terms with free agent right-handed reliever Justin De Fratus on a one-year deal Wednesday worth a reported $750,000. No announcement of the signing has been made. The Mariners are waiting for Tuesday’s trade with the Orioles that will send Mark Trumbo and another player — presumably on the 40-man roster — to Baltimore for catcher/first baseman Steve Clevenger to be finalized. That extra 40-man roster spot would go to De Fratus. 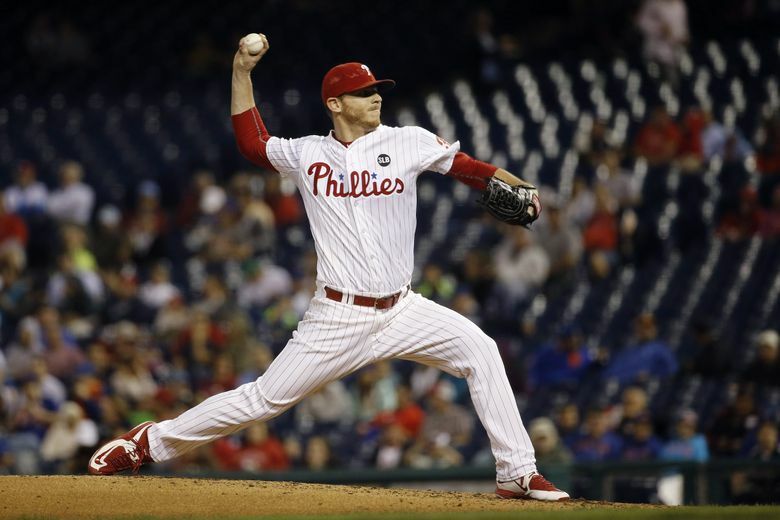 De Fratus, 28, spent the past five seasons with the Phillies, pitching out of the bullpen. His best year came in 2014 when he went 3-1 with a 2.39 ERA in 54 appearances. De Fratus struck out 49 batters in 52 2/3 innings. He struggled last season from overuse and more of a long-relief role. He made a career-high 61 appearances and pitched 80 innings, 28 1/3 more than his previous career high. He posted a 5.51 ERA with 59 strikeouts and 32 walks. He was designated for assignment after the season and opted for free agency instead of an outright assignment to the minor leagues. De Fratus had a fastball that could touch 95 mph but sat consistently around 93 mph. That velocity went down at the end of last season. He also throws a sinker, slider and changeup.